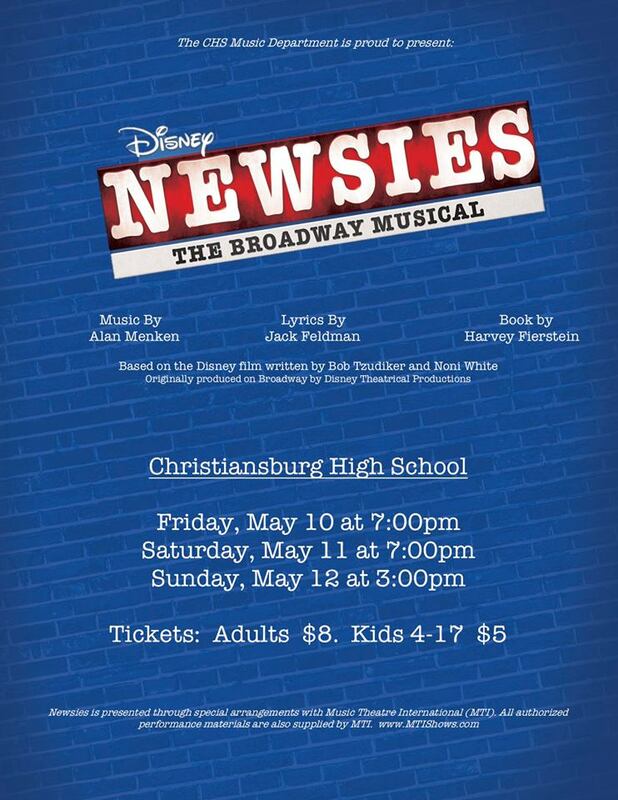 The Christiansburg High School Music Department presents "Newsies, the Broadway Musical" starting on Friday, May 10, 2019 through Sunday, May 12, 2019 at Christiansburg High School Auditorium. "Newsies The Musical" is a musical based on the 1992 musical Newsies, which in turn was inspired by the real-life Newsboys Strike of 1899 in New York City. The musical tells the story of Jack Kelly, a rebellious newsboy who dreams of a life as an artist away from the big city. After publishing giant Joseph Pulitzer raises newspaper prices at the newsboys’ expense, Kelly and his fellow newsies take action. With help from the female reporter Katherine Plumber, all of New York City soon recognizes the power of "the little man". Adults are $8.00 per person and kids ages 4-17 are $5.00. To view the event flyer, visit: https://i.imgur.com/MGK9qNE.jpg. For more information, visit: https://www.facebook.com/CHSchoraldepartment/ or http://christiansburgchoir.weebly.com/.